As mentioned in my last post, I can not go a week without my quilting fix, even if it is just to fondle fabric. If you’re a quilter, you can relate. So on one of our day trips, I found another quilt shop. This one is called Fabricate and it is located in Bar Harbor, Maine. It was a few blocks off the main street that has all the shops and restaurants, but it was worth the walk. The shop owner was very friendly and welcoming and she had a good variety of fabrics, even though it wasn’t a large selection. There was a nice display of fabrics with different kinds of berries. And she had fabric displayed in an old bathtub which is something I’ve never seen before. 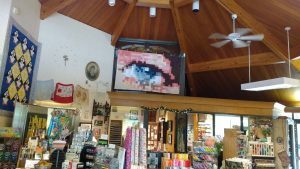 In the photo on the right, there is a big eye that is actually a pieced quilt. When in the shop, you can’t really tell what it is until you look through a camera lens. 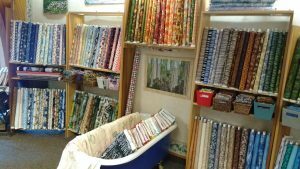 Fabricate also caters to scrapbookers and carries some yarn as well. The store is in a dome-shaped building that was originally a bank, so it’s unique in that respect. Fabricate is definitely worth the little walk from the hustle and bustle of the main street. There is even a couch where you can sit and rest.